Historically, line-of-business organizations have become accustomed to giving orders to their IT colleagues. In many cases, this creates an unhealthy dynamic whereby IT implements protection mechanisms against the business — they throttle change requests or over-estimate work to guard against competing and changing demands. Another consequence is that IT is often excluded from the discussion of new initiatives, thus missing out on important business context. This insular relationship hinders communication between business and IT, leaving business teams frustrated at IT’s inability to respond to digital opportunities and threats. The most effective digital enterprises have a different dynamic between business and IT. Rather than living with the legacy of IT servitude, these organizations recognize that if digital products and services are core to their business, then IT is a core part of the business organization. And often, it is the enterprise IT groups that are the first to realize the value of digital products like APIs, and the necessity of integrating new digital channels with their core technology assets. In digitally mature organizations, line of business groups and their IT counterparts work in partnership with a shared vision, guided by a set of key performance indicators (KPIs). Instead of waiting for the business to give them the orders to “digitally transform,” IT groups are empowered to proactively engage and lead their business colleagues, further improving IT/business collaboration and the resulting outputs. In a recent MuleSoft survey, IT and business leaders reported being more aligned than ever before: 72% of IT leaders reported they are aligned with the business versus 57% in 2018. 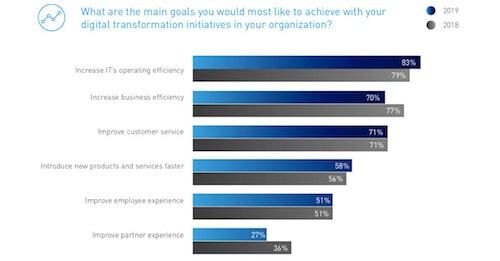 The alignment between the two functions goes as deep as shared KPIs with the top two digital transformation goals being increasing IT operational efficiency (79%) and increasing business efficiency (77%). An encouraging shift is taking place, with IT moving away from an exclusively operations-focused role into more of a central business role. This sets the stage for success in the digital age. As software delivery increasingly becomes a core competency for every organization, IT is being asked to deliver 32% more projects on average year over year in addition to its more traditional role of keeping the lights on. The customer experience focus of the digital transformation movement is involving more parts of the organization in application integration, traditionally an IT-only concern. 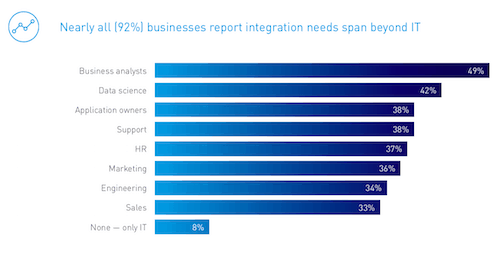 The vast majority (92%) of respondents in MuleSoft’s survey say integration needs span beyond IT, with each business unit requiring a unique use case for integration. Among the most common are business analysts (49%), data science (42%), application owners (38%), support (38%), HR (37%), and marketing (36%). While 22% of the IT budget is spent on integration each year on average, this figure has not changed year on year. This means that IT must approach its new digital leadership role with focus and prioritization to maximize the resources at their disposal. 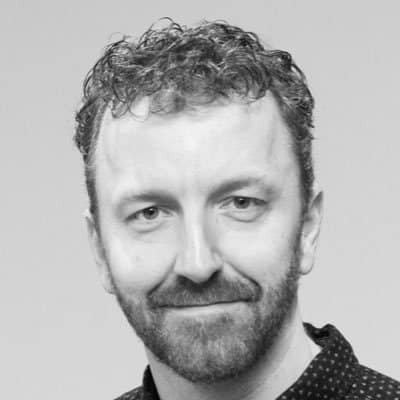 Many organizations are launching API Programs to accomplish this, and to connect their digital strategy to execution through optimized software delivery, digital product management, and the cultivation of API ecosystems. My focus is to help organizations successfully design and execute these programs, and I will be sharing more information on that topic in the future. In the meantime, to discover some of the ways IT teams are tackling the growing demands of the digital age, read our Connectivity benchmark report.